WCS Garden Cover Crop Mixes help to reduce erosion and compaction, and increase water permeation in the garden. They also hold minerals normally leached from your soil over the winter. Densely planted cover crops will suppress perennial and winter annual weed growth. The top growth and roots add organic matter to the garden soil. The cover crop's root system also opens passageways that help improve air and water movement and supports microbial life. This microbial life works synergistically with the roots, bacteria and fungi to improve soil health. At the end of the garden season you may be ready to rest, but your soil is not. One final effort can make a big difference: cover cropping. All gardens benefit from the use of cover crops, or “green manures” planted at the end of the season. Tilling, weeding, harvesting and foot traffic tends to destroy soil structure. Planting cover crops is an easy way to revitalize the soil and help soil tilth. Cover crops are planted in vacant space and can be worked into the soil. They provide a number of advantages to the otherwise wasteful use of space during your garden's off-season. Traditionally, cover crops are plowed under, crushed, cut , or pulled and used for mulch or compost. Cutting dense residue may help to avoid the potential negative reactions between rotting residues and new plantings and composting cuttings may produce a more balanced soil amendment compared to chopping raw-crop residue directly into the soil. The advantage of rolling, crushing or using winter kill varieties is to leave the soil surface covered and relatively undisturbed, preventing weeds from growing. In the spring, just plant through and let it act as your mulch. Tilling or pulling is NOT recommended as it destroys root and earthworm pathways, reduces the beneficial microorganism population and oxidizes soil organic matter. Our Beneficial Mix is excellent for attracting beneficial insects and providing habitat. It contains Grasses, Buckwheat, Clovers, Cereal grains and flowers known to attract ladybugs, lacewings , and others. Our Raised Bed Mix will help re-energize already good soils that have been depleted through the growing season. The Summer, Fall, Late, and Cover and Color Mixes are designed to provide high biodiversity and soil improvement depending on your planting cycle. Our Summer Mix also attracts pollinators. 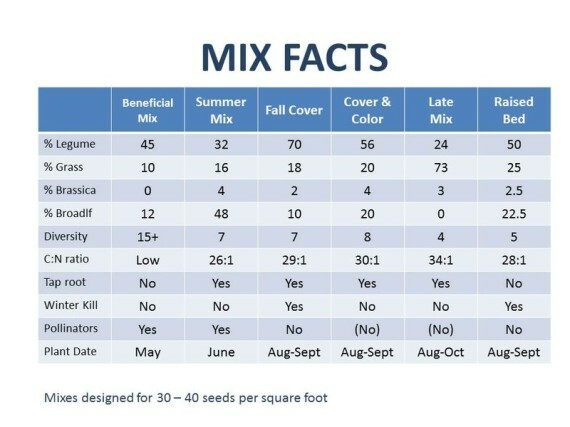 The table below summarizes the composition of the different mixes.